A fastest and smartest personal finance app in the world. Record directly from Notification Center. By analysing your past data, 1SecMoney predicts possible categories, items and amounts. Just click and record! You can also set the number of rows displayed. 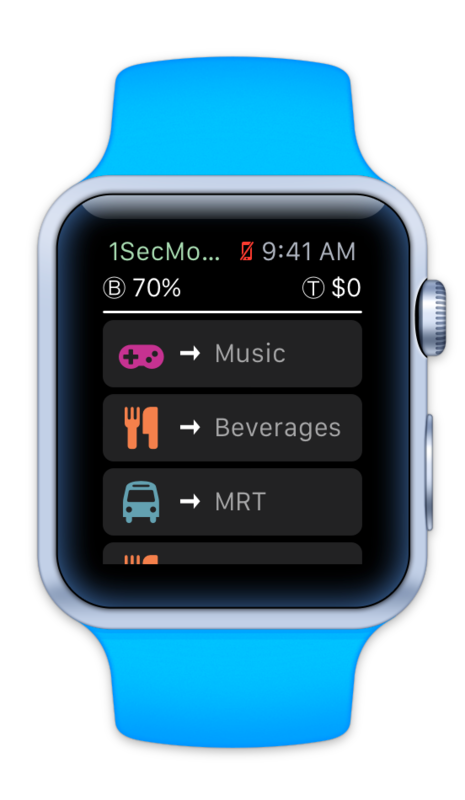 Record anytime anywhere on Apple Watch. Only two clicks to complete a record. Auto complete of the most likely category and items to save on typing time. As well as the default options, the app can also predict what you are typing. These options are sorted by frequency of use. Just tap the history list, and the row data are copied to corresponding input fields. No typing required. Determine expense or income according to the category name. Don’t do anything. Defaults to no account, so no complexity if don’t use this function. Create multiple accounts that are individually managed. 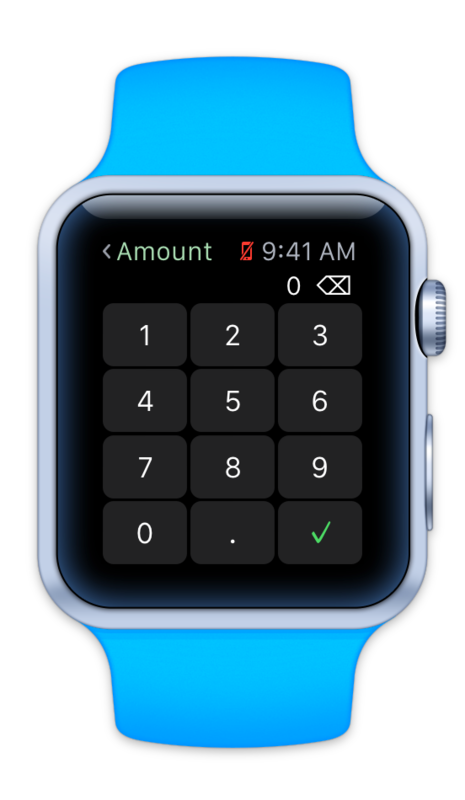 You can also transfer money between accounts and see reports on each account. Different accounts can have different currencies. Support for more than 170+ currencies with automatic exchange rates update, including virtual currency Bitcoin. Can set recurring expenses and income, daily, weekly, monthly and so on. 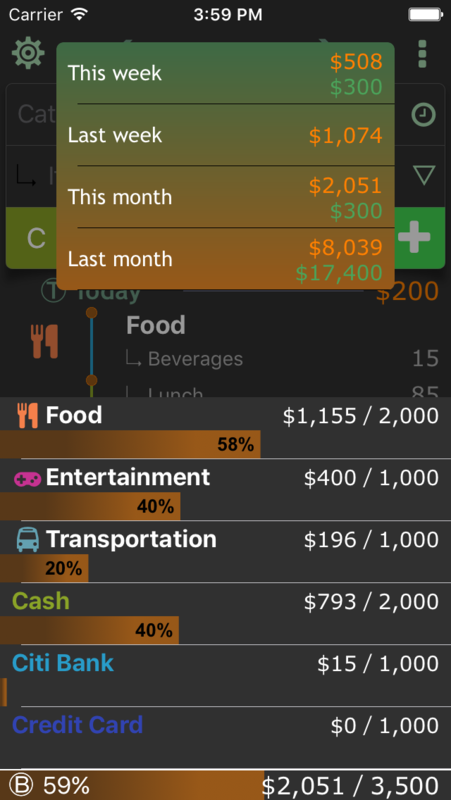 Set a limit your monthly/weekly budget so you can handle your expenses. You can also set a different budget for each category. The app will send a notification to remind you at specific times If you forget to record. Support passcode lock and Touch ID. 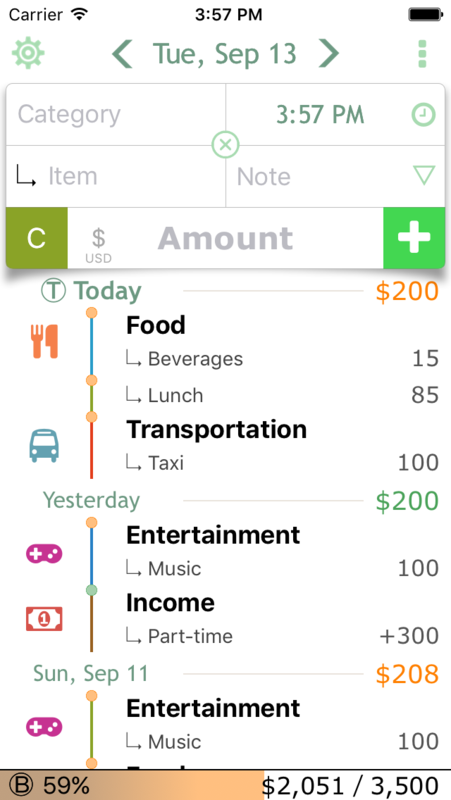 Import your past expenses/income from another app, and instantly get your own grid list. Export expenses/income via Email and other apps that support Document Provider, such as iCloud, Dropbox and Google Drive. Auto backup via iCloud. So you don't worry about data loss even when you miss your iphone. Enter keywords to search past expenses/income. Keywords can be category, item, amount, note and account. Use whitespace to split keywords. See the calendar to know recent expenses and which day you forget to record. Clear and concise reports let you analyse how much you spend and how much you earn. If you don't want to waste 30 secs recording the purchase of a drink. You must try this app.